Want to keep up with today's fast-paced and graphics-intensive business communications ? 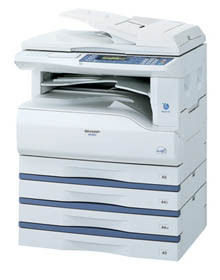 The AR-M207 has all your basic office needs covered in one powerful document solution that delivers ultra-efficient copying/printing, brilliant colour scanning, and optional Super G3 faxing. In addition to its extensive range of superb copier and printing functions, the AR-M207 offers convenient connectivity for small workgroups with a Smart Sharing interface for up to 3 users. And with options available for powerful network printing/scanning, the AR-M207 even has the functionality to grow with your business. Conveniently packaged in a compact and user-friendly design, the AR-M207 delivers the power and ease-of-use that today's businesses are looking for.